Antec has kindly sent me a Dark Fleet DF-85 case and CP-1000 PSU to review. 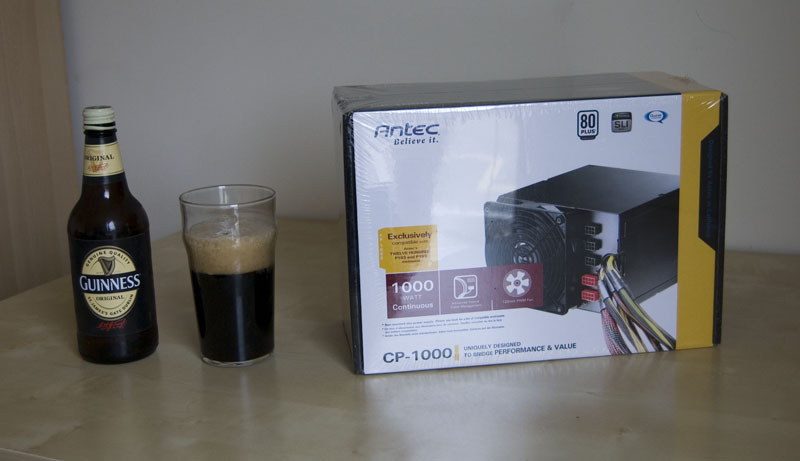 These products are aimed at the upper end of the market; both products are in Antec’s ‘CPX’ form factor and designed to work together. 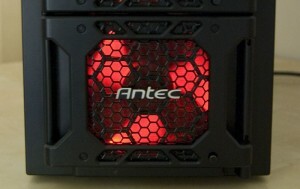 The PSU is being reviewed as a part that is complementary to this case: please see the Antec CP-1000 review at JonnyGuru for a very thorough review of the electrical performance of this unit by Oklahoma Wolf in more detail than I could ever hope to achieve. 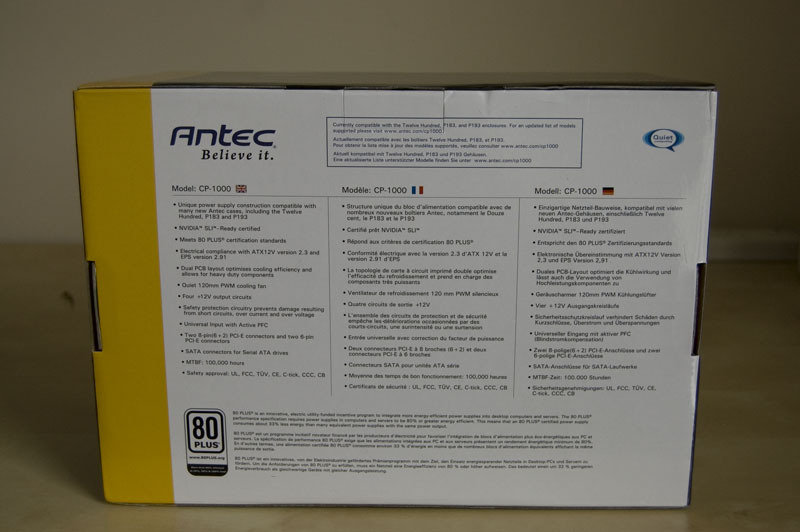 The CP-1000 PSU, like the DF-85 case, is one of Antec’s CPX form-factor products. 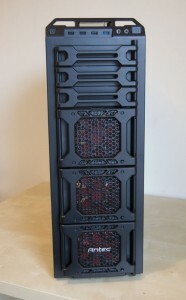 It’s a very large unit, standing a good couple of inches taller than a standard ATX PSU. The fan on this is a 120 mm model – and this is on the shorter side of the PSU, making it around 5 inches tall. Hopefully the… ahem… visual aid ought to help show the size of it. The unit is sturdy and everything feels very solid. 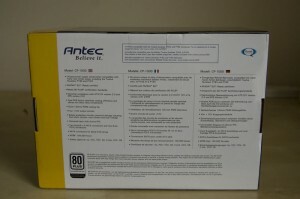 There is the usual bunch of certifications, including “80 PLUS” and a five year warranty. 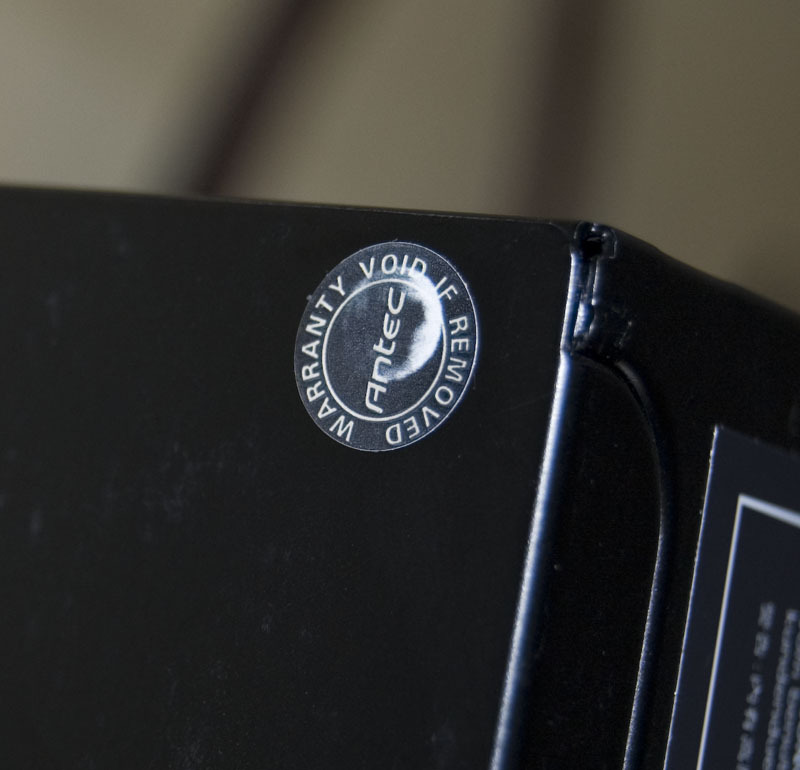 I tend to keep PSUs quite a long time (the one in my home machine is about 5 years old) so a long warranty is a good thing in my opinion. A quick look on the web shows that this product currently sells for about £120 in the UK and about $150 in the USA. It’s a lot of money, but a lot of wattage and a well known PSU brand. 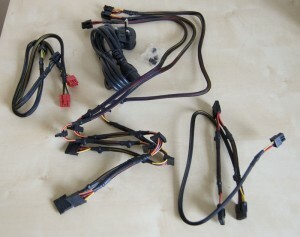 The unit comes with a number of hard-wired connectors, as well as five connectors for the modular parts. 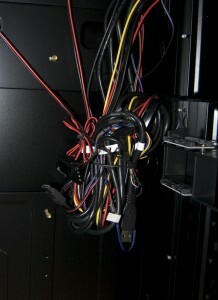 Although, there are six modular cables, you can only use a total of three of the SATA or Molex cables. In theory, you could power a whopping 12 drives just using the SATA connectors, and more if you used a few Molex-to-SATA adapters. 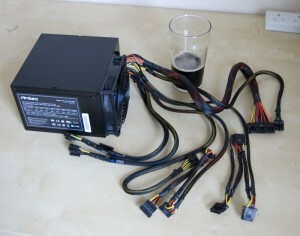 The inclusion of two modular PCIe connectors as well as the two hard wired ones means that this should be suitable for any SLI or Crossfire setups. 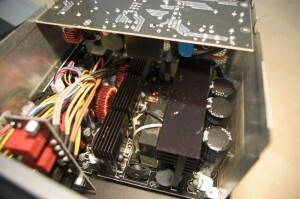 Unfortunately though, only 840 W can be drawn from the 12V rails – the other 160 W is taken from the 3.3 V and 5 V rails. I’d have liked to have seen more of the cables made modular; for example: I wont need any of the PCIe connectors for the test machine. I suppose you could argue that most people with a 1 kW PSU will be hooking it up to some GPU behemoth(s), but as you’ll see from the case these two products would also lend themselves very well to a PC with a lot of hard disk drives. 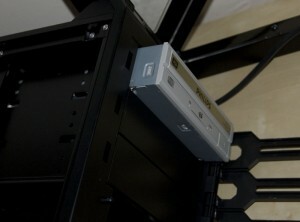 Hot-swap SSD bay (2.5″) at the top of the case. 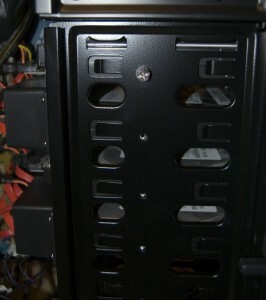 Hot-swap HDD bays (3.5″) down the front of the case. 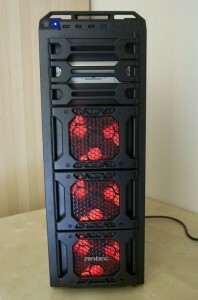 Three variable-speed (via a knob) front 120 mm LED-lit fans. Two two-speed (via a switch at the back) top 120 mm fans. 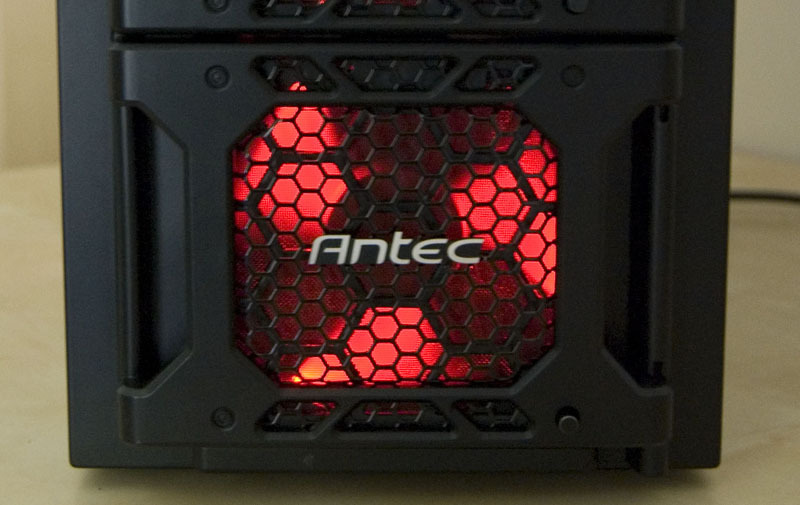 Two two-speed (via a switch at the back) back 140 mm LED-lit fans. 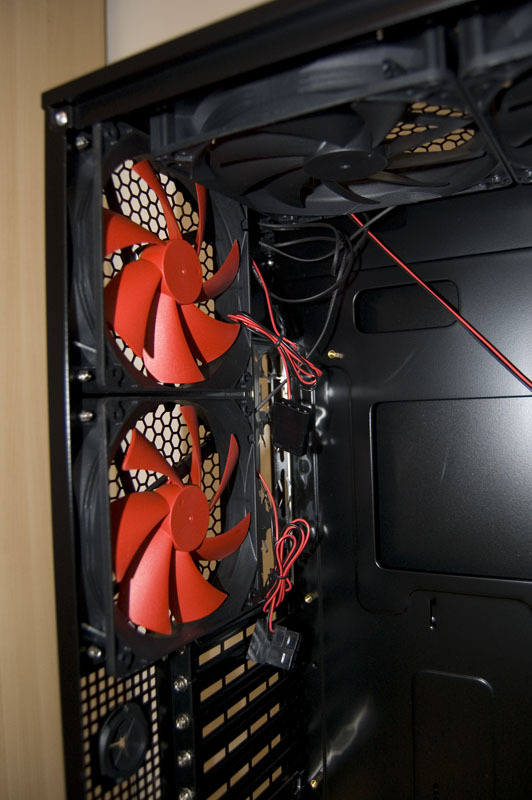 Space for a 120 mm fan over the graphics card area (optional). 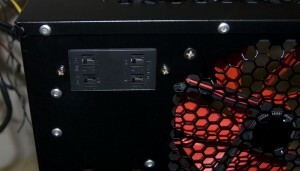 Front USB ports, of which one is USB 3.0. 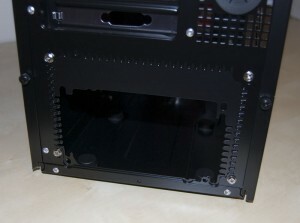 Rubber-lined holes for running water cooling tubing in and out of the case. The unit seems weighty and solidly built, which I find very important. I’ve had a couple of cheap PSUs die on me before, and those usually felt like they were made from tin foil. I don’t have the fancy kit (oscilloscope and such) in order to really put this unit through its paces. JonnyGURU – who most definitely have all the gear – have reviewed this unit and given it a pretty good score of 8.5, with the main complaint being that it doesn’t offer a lot more than the 850 W model (CP-850). The images I have taken of the innards suggest it’s pretty much the same kind of unit I have (made by Delta) although I’d really need to rip it apart to confirm this. 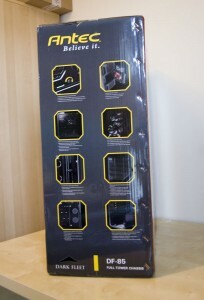 As you would expect for a case selling for £130/$170, there are a number of external and internal features. 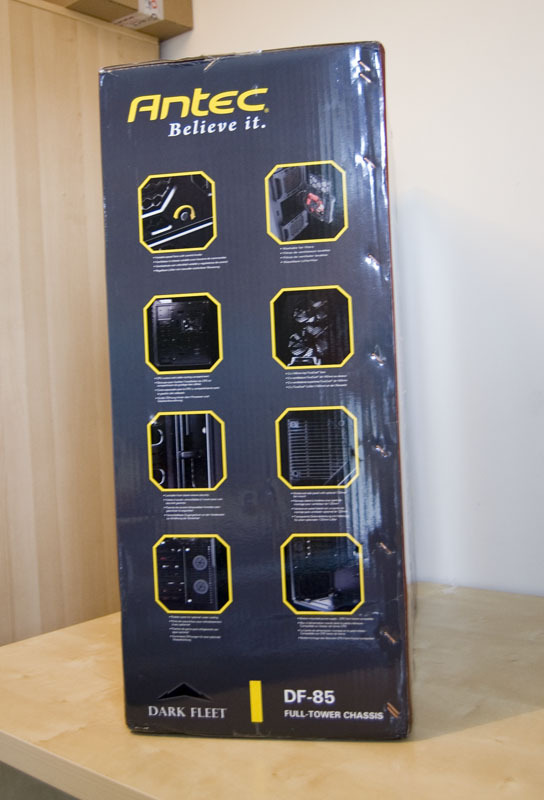 The front of the case looks better in real life than it does in photographs. Initially, I thought this looked pretty damn ugly. Once I recieved the unit and had a look around, I reckon it looks rather sharp. 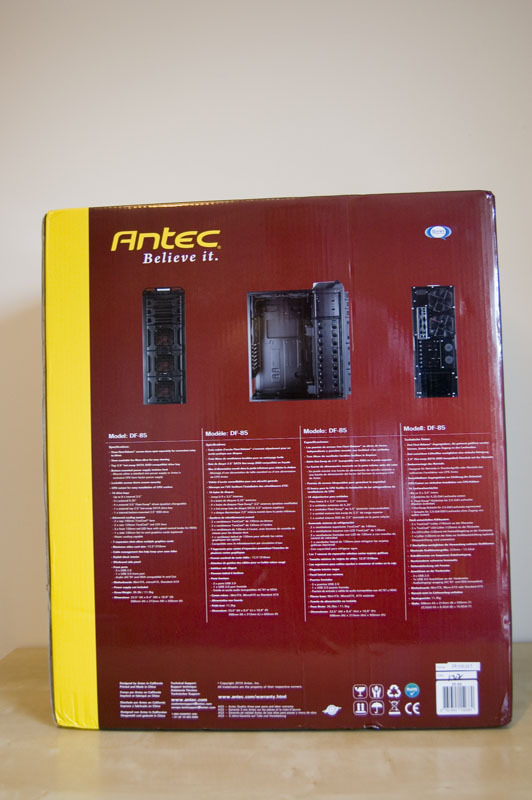 It’s a very loud, noticable design which contrasts quite a bit with the more sedate P-series and is more “in your face” than the Antec Twelve Hundred (both of which are also in the CPX form factor). 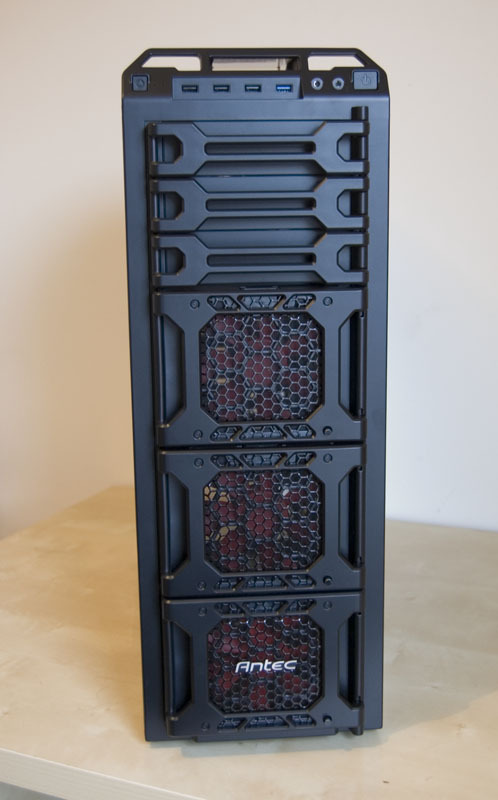 Looking at the design and build of the case, it’s mostly pretty good. The metal edges are rolled – no cut fingers! – and the case feels sturdy. 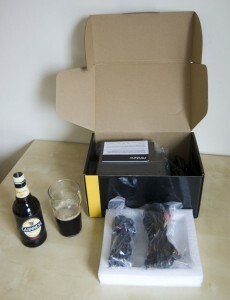 The metal is coated with a nice black finish, and the plastics feel quite robust and look – for the most part – good. I’m quite clumsy, but haven’t managed to scratch or dent this case, even with turning it over a few times. I’m not so keen on the side panels, however. They don’t come off and go on quite as satisfyingly as I would like, and I found them quite fiddly to screw in. Looking at it from the front, the hot-swap SSD bay is at the top. This just screams gimmick. I may be completely wrong here, but if you build a system around an SSD, you want to put your operating system on it. Hence, the SSD is likely to be the one drive that you really never want to actually remove from the system. There is, however, a nice space on the floor of the case for mounting a 2.5″ drive using the supplied screws and rubber feet. There are three doors on the front of the case that hold 120 mm LED-lit fans; behind these there is access to the 3.5″ hot-swap rack – I’ll look at these in more detail when I put a machine in there.There is a switch inside the case with which you can lock the front covers shut. Also, at the top of the front there are three … erm… hinged covers? I’m not sure what the point of these are, to be honest. They don’t look great, they don’t actually cover your 5.25″ drives, and despite being made out of relatively solid and robust plastic the hinges don’t feel that solid. I’d have rather seen a door here that covers all three bays, with a suitable design on the front. 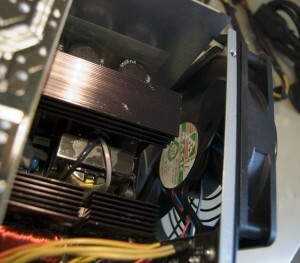 On the top we have two two-speed 120 mm fans. 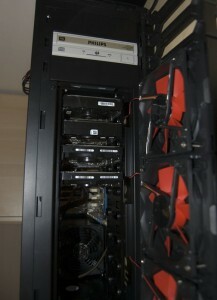 The top and rear fans are both controlled by a set of switches at the top rear of the case. 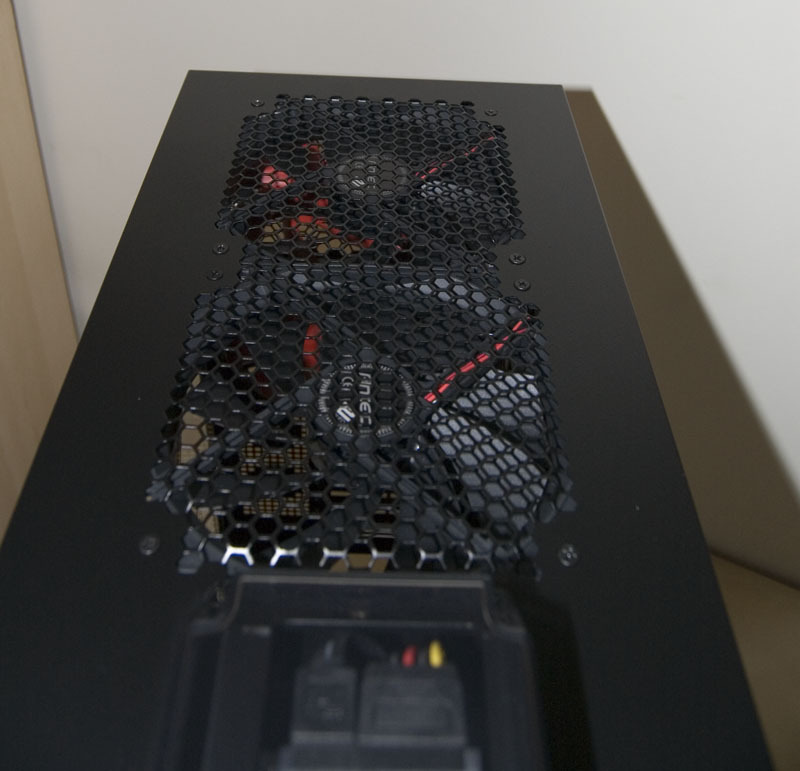 Looking at the rear of the case, there is a space at the bottom for the PSU. 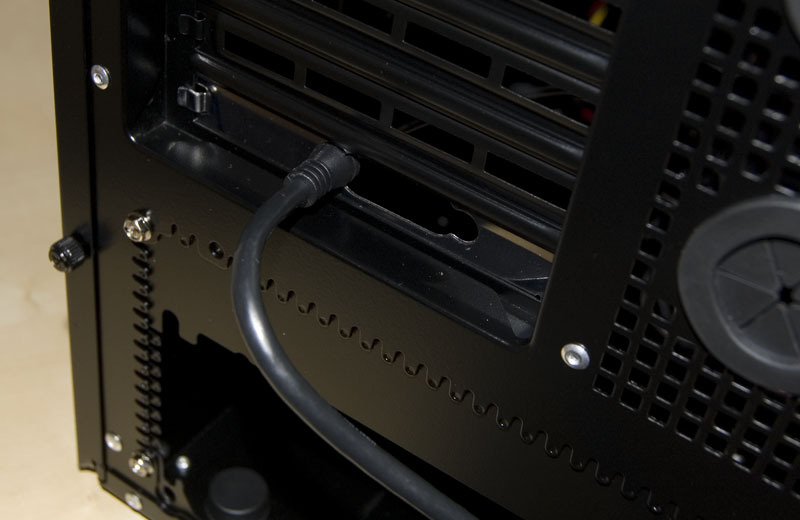 A metal plate allows the case to be used both with a standard ATX unit or with the larger CPX form-factor models. 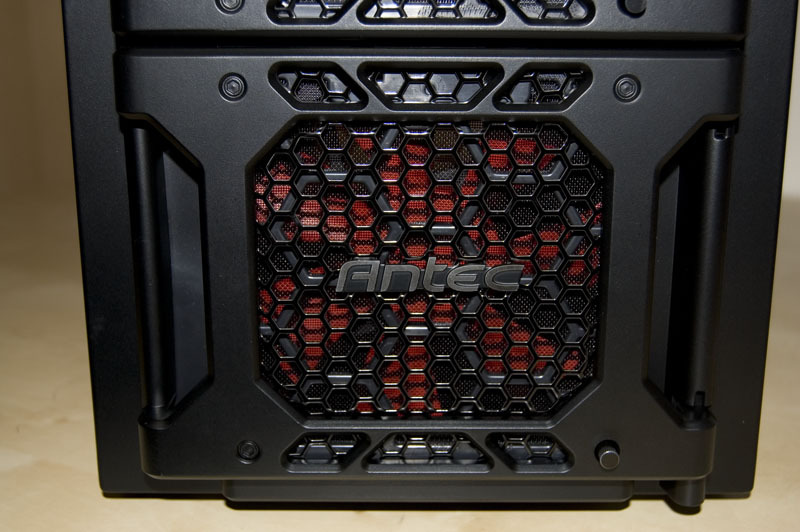 You can also see the rubber-lined holes for running water-cooling hoses into and out of the case, as well as the two rear 140 mm fans. Inside the case I found a bundle of wires hanging together. 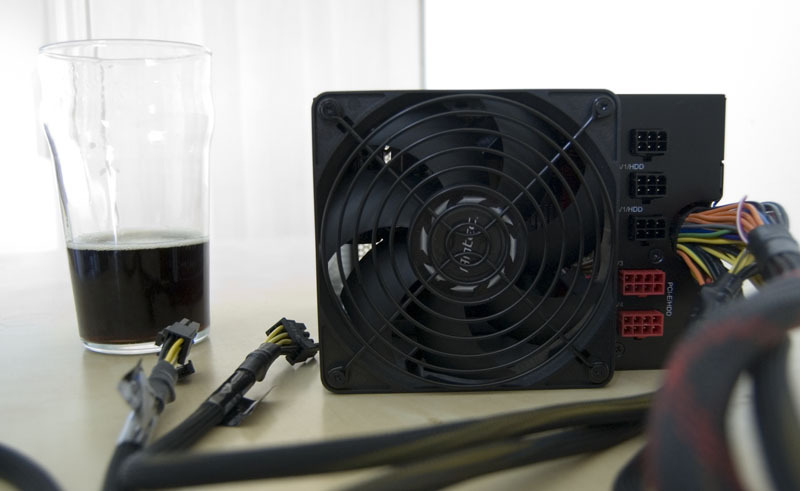 The fans are powered by molex connectors that can be daisy-chained together; there are also the standard power switch/reset switch/power LED/HDD LED cables. 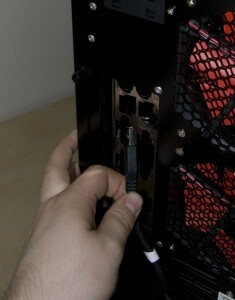 The USB 2.0 ports are connected up via the header on the motherboard, but the USB 3.0 port is connected via a USB-A plug which has to be connected to the rear of the machine. 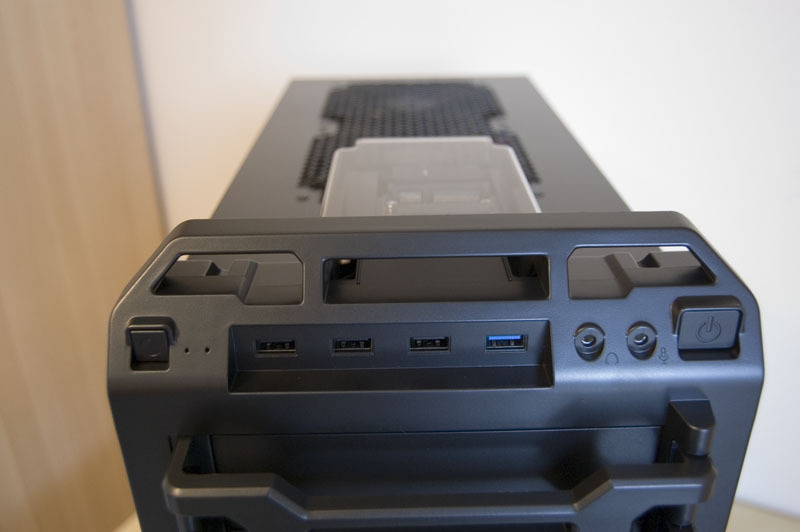 Although a special bracket is provided (the one in the bottom slot as you can see from the bottom left picture above) that the cable clips in to, it’s not long enough to reach the USB ports, so you’d need to move it up a few slots, where it might get in the way of expansion cards. ... but doesn't quite reach! Lifting the other side panel off reveals a useful gap between the motherboard tray and the side panel. It’s not the most generous gap: if you’re stuffing a fair few cables in there it might get tricky to replace the side panel. 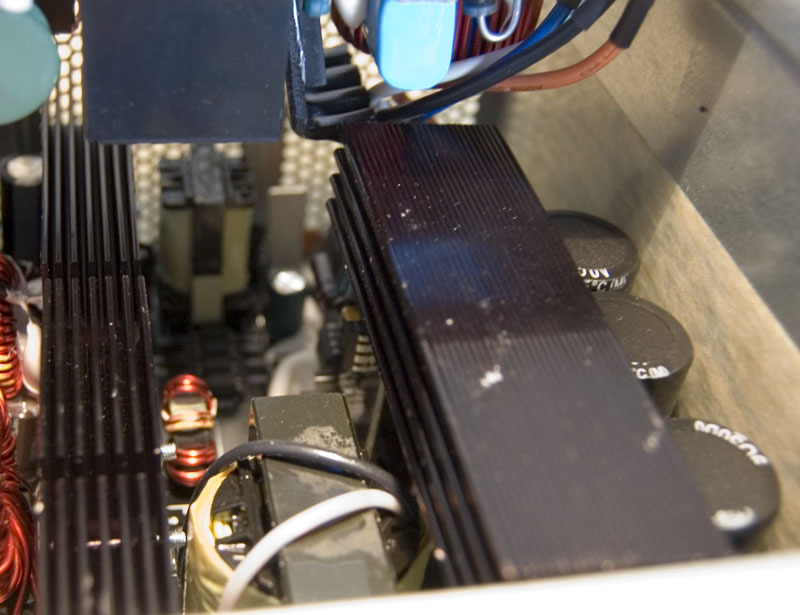 The motherboard tray isn’t removable – it’s not a critical weakness, but a removable tray often makes installing your system easier and makes the case more appealing. Especially so if you’re aiming at a demographic that – to quote my better half – “just can’t leave the damn thing closed”. 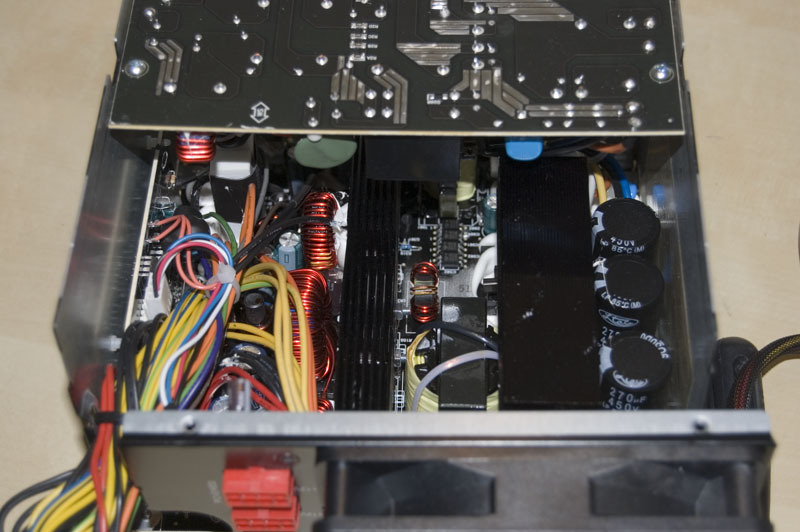 Helpfully there is quite a large space around where the CPU socket on the board will be, which should be good for people using backplates or mounting gigantic cooling apparatus to the CPU. Despite a few niggles over the design of the case, it definitely looks and feels like a nice premium case. As these two products are both part of the CPX form-factor family of products, I was very interested to see how well these work together. The CP-1000 PSU is only compatible with four cases (of which the DF-85 is one) and so I’d expect this to mean that the two products are designed to work really well together. 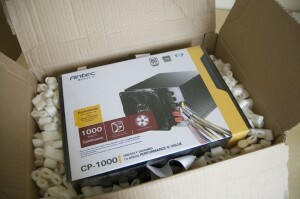 The first test of this is putting the PSU in the case. 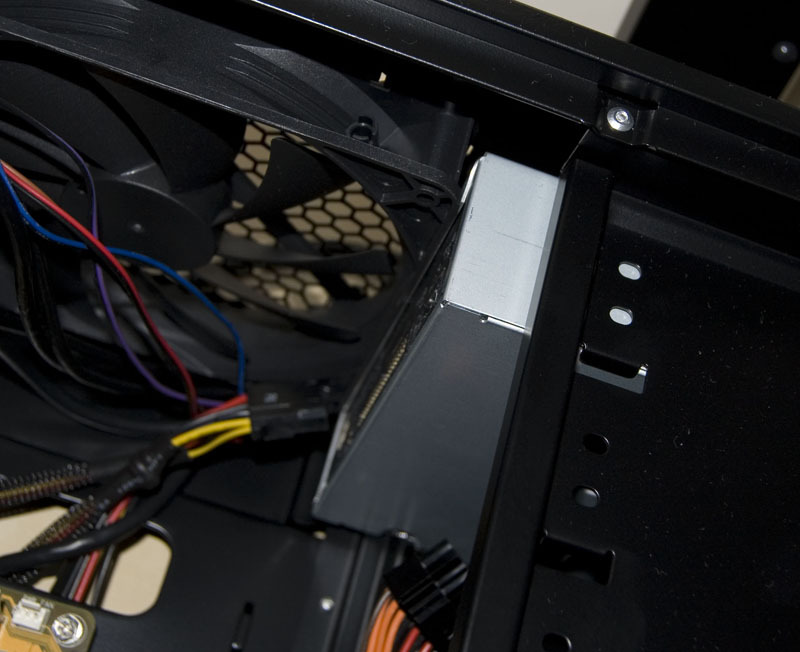 Firstly, a bracket needs removed above the PSU bay inside the case, and moved up one notch. 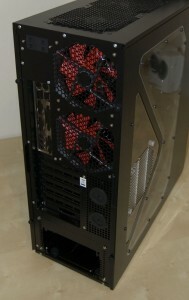 The lower position holds an ATX PSU in place, the upper is for CPX units like this. 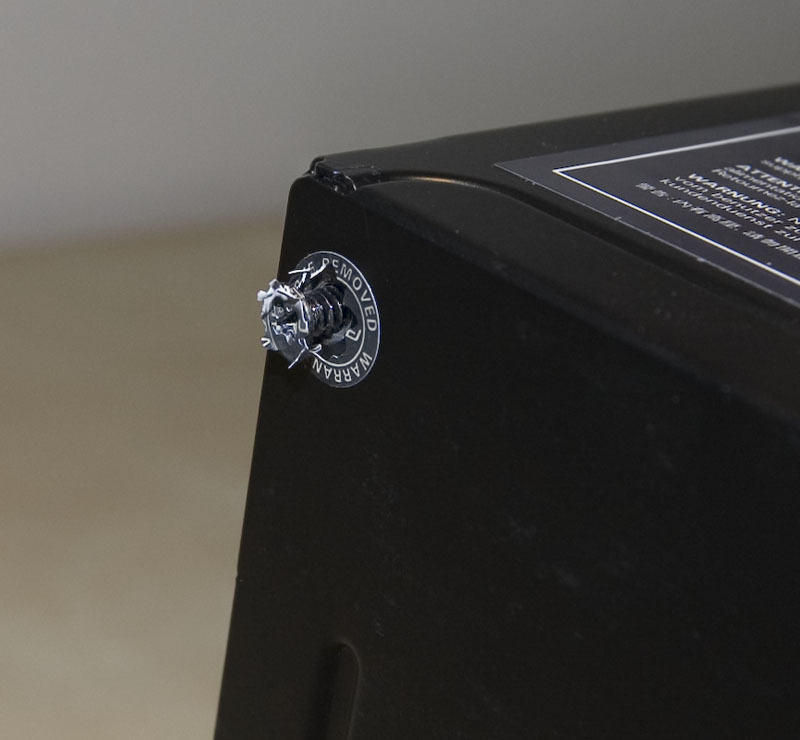 Secondly, the back plate screws out, again because we’re using a CPX rather than an ATX unit. The rest is all straightforward, as you would expect. 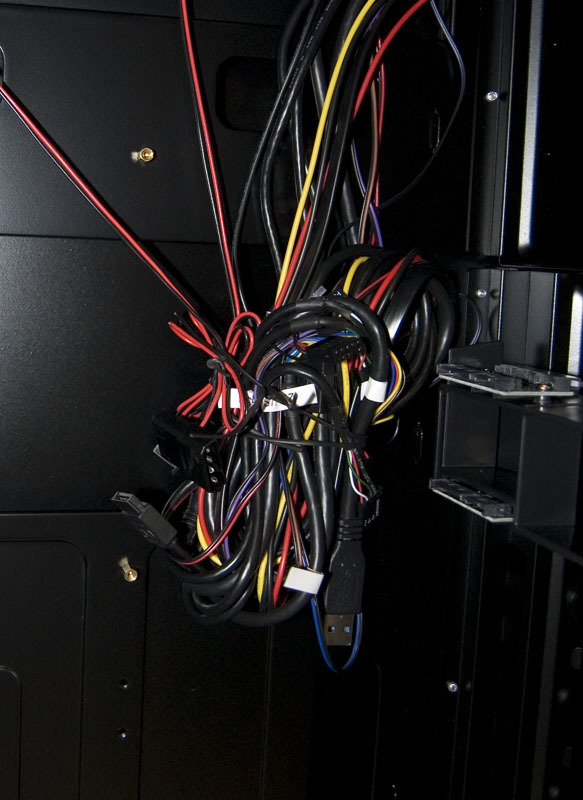 Looking at the lengths of each cable – while placing the ones I wont need out of the way – it became very quickly apparent that the cables are not long enough. 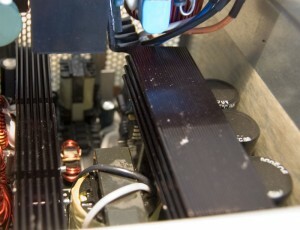 The ATX cable doesn’t have enough length to reach round the back of the motherboard tray then over the top of the board to the relevant socket. The EPS12V/ATX12V cable has the same issue. The molex and SATA connectors are only a little on the short side, but another few centimetres would have been nice to allow for some cable management. As you can see from this thread of cable-managed case pictures, a number of our members do rather like their cable management! 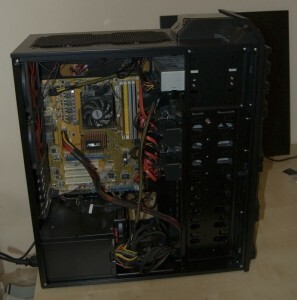 With the PSU in place, the case is ready to receive a computer. 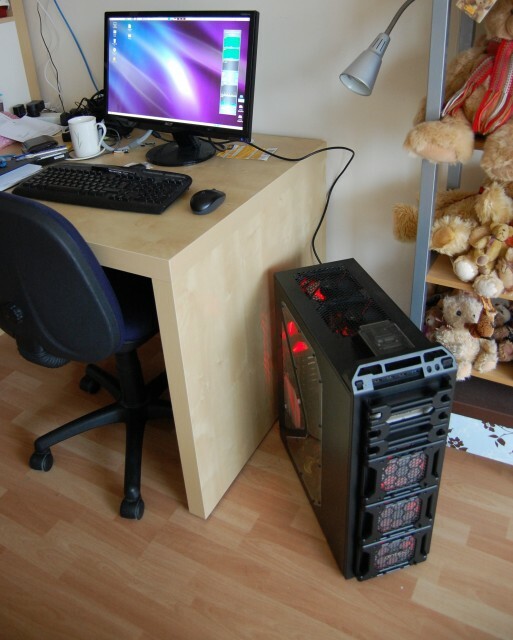 This is my home machine: it only gets switched off or rebooted when I need to move it or sort out the power cables at the back of the desk. 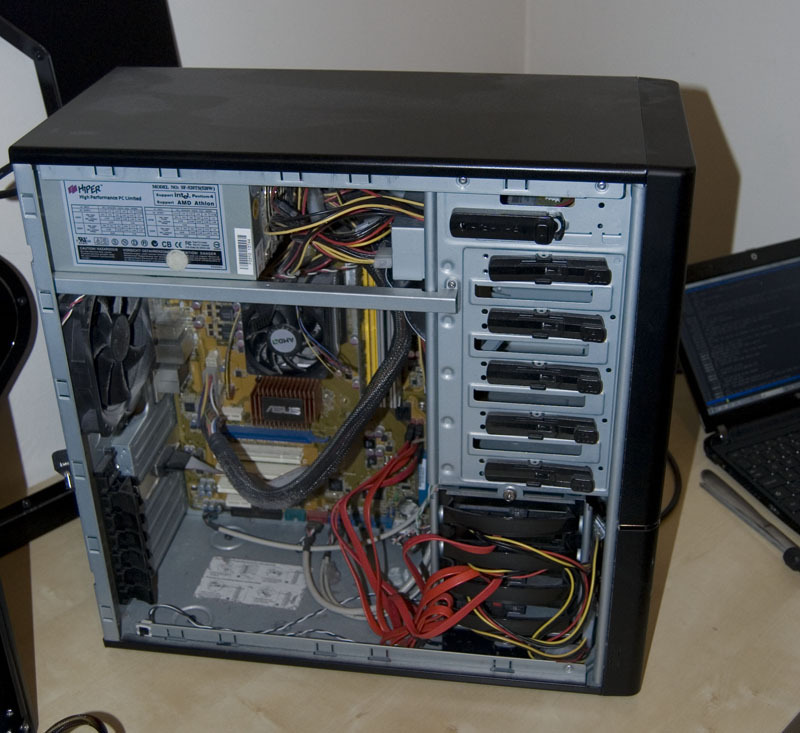 It’s what I think of as a “storage-heavy” machine as it has quite a few drives and fills up all four 3.5 in bays in the case. It runs Rosetta@Home for the Overclockers.com team (shameless plug!) and tends to sit at ca. 70 C under load which is a little warm. The cables, as you can see from the images below, do rather need some attention. 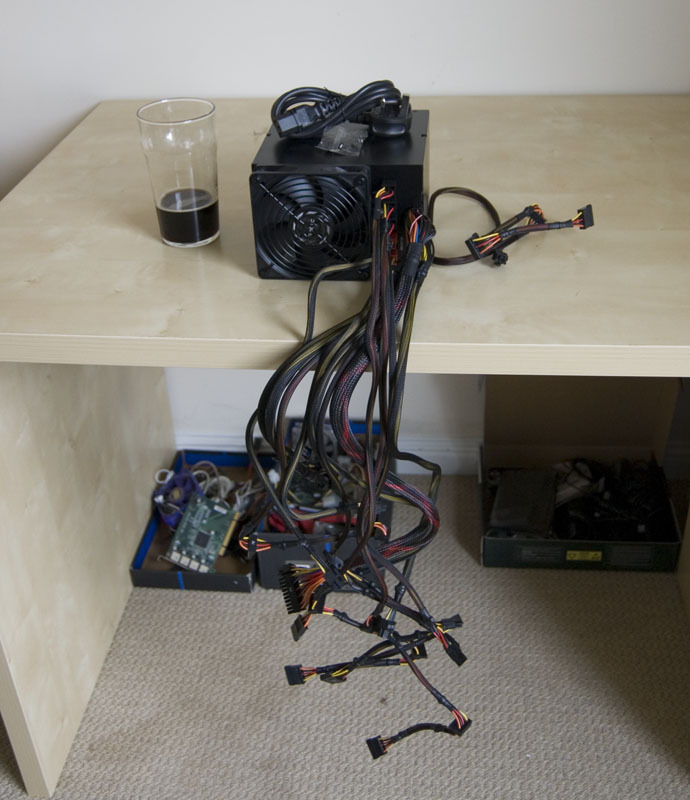 In transplanting this into a new case I’ll be looking at the effects on the case and CPU temperatures as well as how it deals with the number of drives. 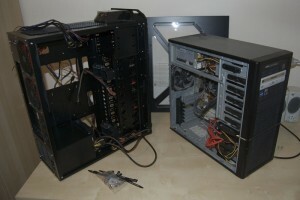 Moving the system from case to case was relatively easy: the hard part was removing the board from the old case. 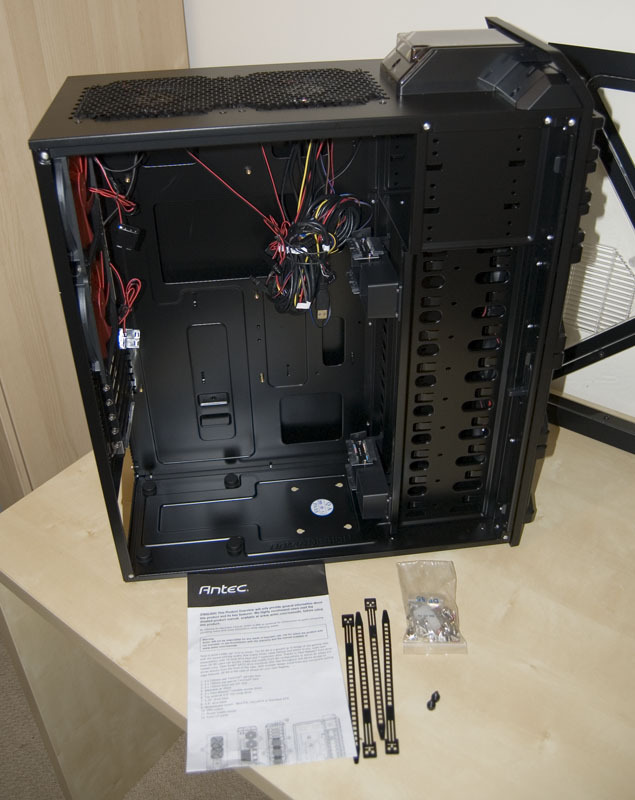 Installing the motherboard was simple – the ATX board fits into the case with plenty of room to spare. 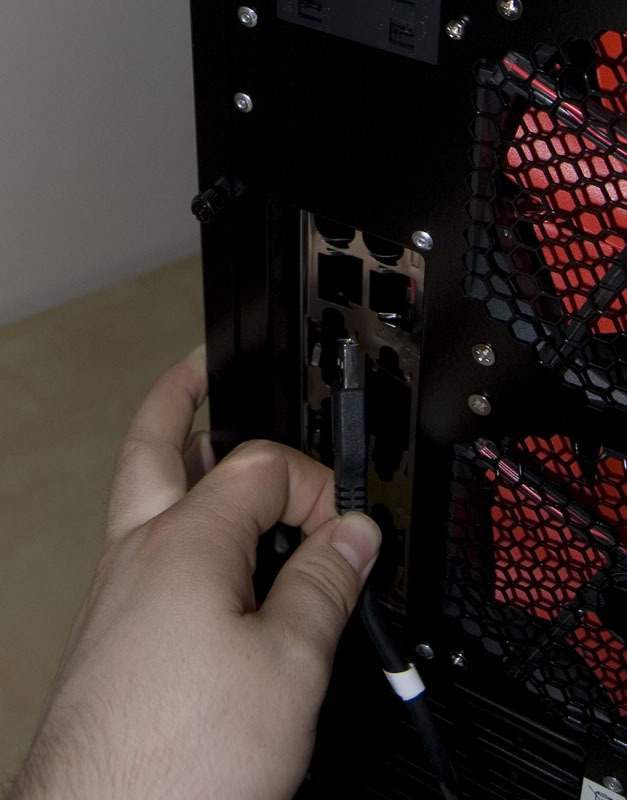 Hooking up the power connectors (ATX and EPS12V/ATX12V) was made more difficult by the insufficient length of the cables: although they reached the connectors there was not enough length to tidy the cables away neatly. 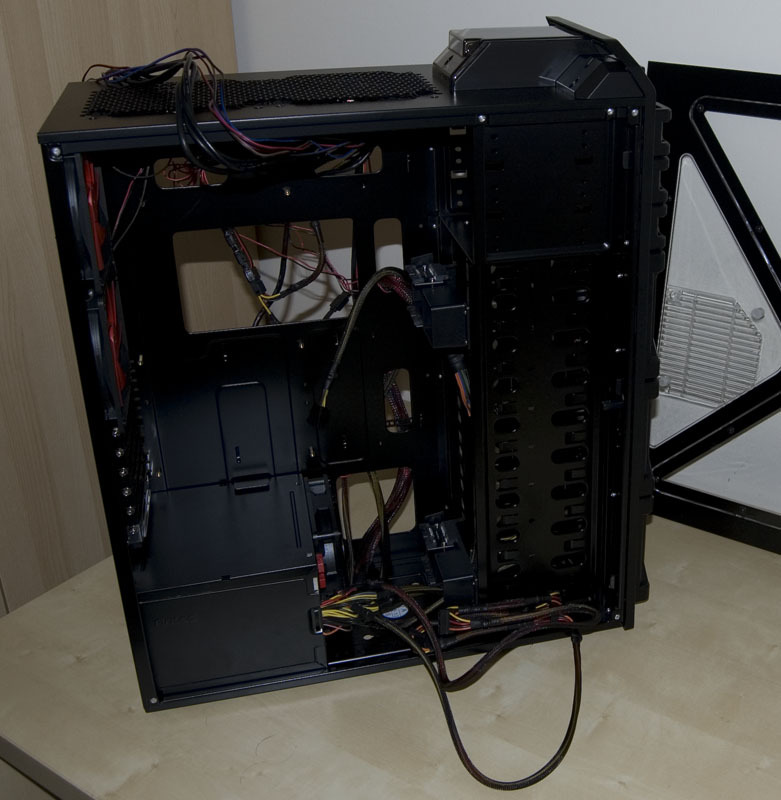 A case with a window implies that you want your system to be seen, and so I’d expect the cables to be long enough for some cable management. The only other major issue was the DVD-RW (and not the fact that it’s white, and therefore doesn’t match!). 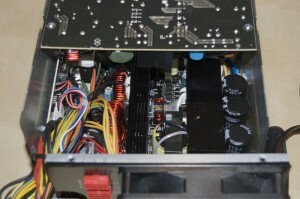 There are three 5.25 inch drive bays, however the top one is not deep enough. One of the top-mounted fans is in the way. The case either needs to be an inch or two deeper overall, or the top bay needs to be made into a 3.5 inch one ideally. 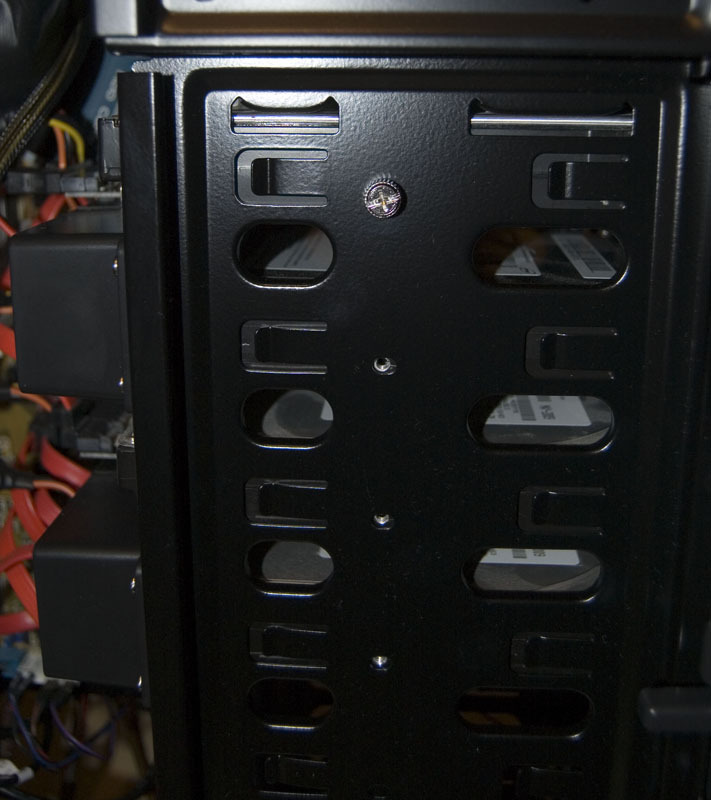 Installation of the hard drives, however, was far easier and proceeded without a problem. 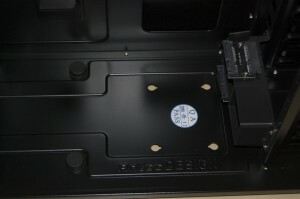 The way in which the hard disks are installed in the case is very well thought out. I particularly like that there is room for a total of nine 3.5 inch hard disks, which is ideal for file servers or large RAID setups. Two adapters (pictured below) can be used to make four of the bays into hot-swap ones. 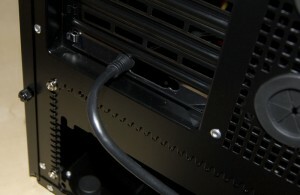 The SATA and power leads plug into these, which allow the drive to be slid in and out from the front. The drives can then be secured with thumbscrews. The hot-swap mechanism is pretty solid; drives can be inserted, with care, quickly and smoothly. 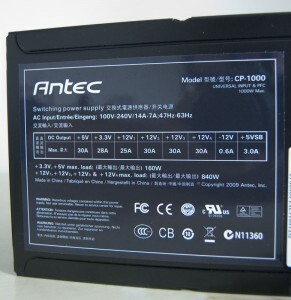 It would be great if it was possible to purchase more of these adapters, although the Antec website doesn’t mention if they are available. The only part of the installation I couldn’t fully test was the installation of a full-size graphics card. It is possible, however, to assess the space available for a graphics card. If the hot-swap adapters are present directly in line with the PCIe slot(s), the space will limit you to small to medium sized cards. If, however, you either don’t use the hot-swap adapters or if you move these down towards the bottom of the case, there is plenty of space for graphics cards up to (and indeed, larger than) the width of the board (ca. 10 inches/25 cm). 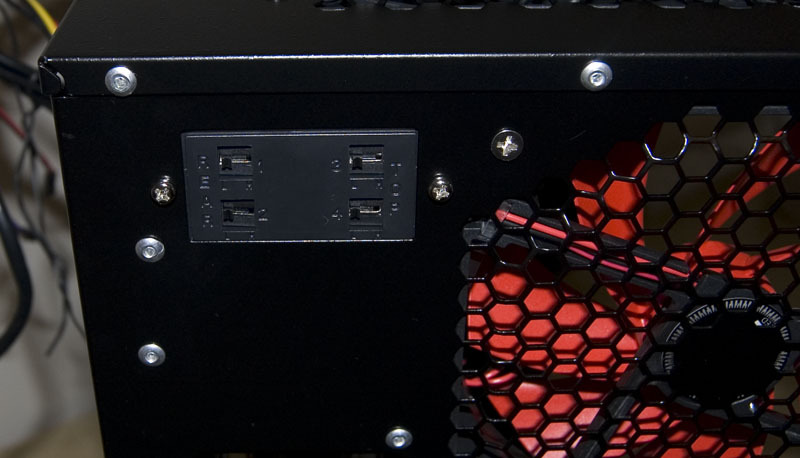 This available space, plus the (potentially) four available PCIe power connectors make this case and PSU a good choice for a powerful gaming rig utilising SLI or CrossFire. 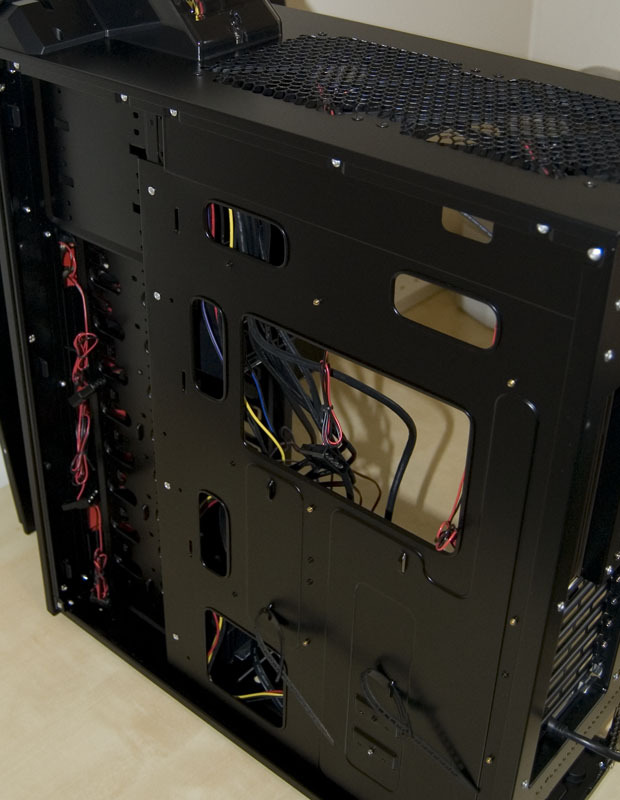 The space behind the motherboard was used to … ahem … tidy (if that’s the right word) the extra cabling. The gap isn’t quite big enough however and the side panels don’t feel as robust as I’d like, so it was a little bit of a struggle to replace the side panel. Once the side panel was on, it was time to turn the machine on. The system was placed next to my desk. 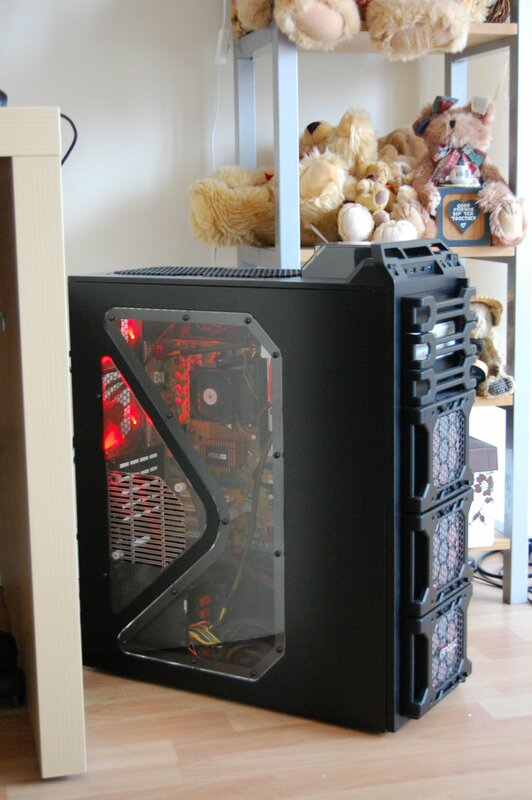 Unfortunately, because of the extra height, it wont fit exactly where the old case was. This will likely contribute to the improvement in temperatures: the case temperature was a few degrees lower (ca. 34°C versus ca. 40°C beforehand), but there was little change in the CPU temperature (68°C versus 70°C). 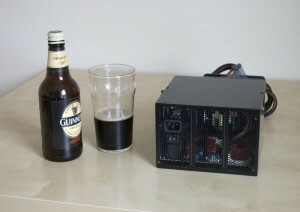 I am using the stock cooler, however, which is probably where the cooling bottleneck is. The stock cooler is probably to blame for the high temperatures. 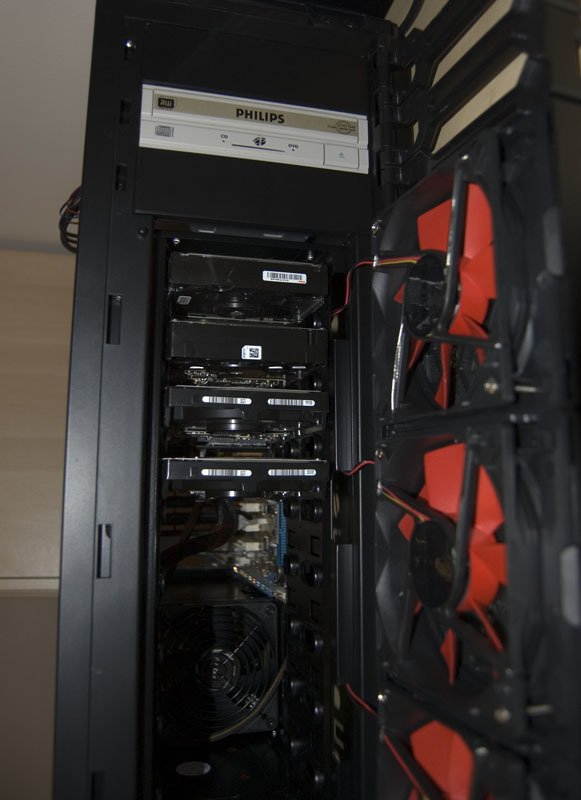 Despite having a total of seven fans (versus 1 in the old case), the noise isn’t a problem at all with all the fans set to low speed – the majority of the noise comes from the CPU cooler. The noise becomes very noticeable once you increase the fan speed, but it’s mostly low-pitch “whooshing”. This is definitely an acceptable level of noise for a case with this many fans. This case surprised me – I wasn’t particularly keen at first, but after getting hands-on with the case and putting a live system in it I have come to like it. Its solid and easy to work in. It looks pretty good when the lights in the room are off, and is currently begging me to pick up an X6 and a 5770 to build a nice gaming rig from it. Unfortunately at this point in time, neither my wallet nor my girlfriend will allow such a build… but soon! 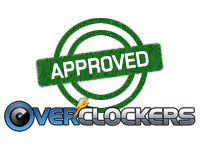 We can’t give a rating to the PSU, but the case is most definitely Overclockers.com Approved. I was ordering some spare parts a few days back for my nine hundred directly from Antec and was told they were phasing out the Gaming series, considering to me the gaming series is a lot more conservative looking than the Dark Fleet I hope they release another high airflow series that appeals to people not taken up with bling and like simplicity and function over crazy looking plastic over the front. Also they really need to stop using that same old side door look from the gamer cases if they want to create a new series...besides that performance wise they are headed in the right direction dropping the big boy fan and using 120mm slot that you can buy any quality drop in you chose. Good Review...wish they would somehow make all their future cases compatible with their new form factor of power supplies. Whenever my father-in-law is done with it. He has made progress (saw it over a weekend in August) and has all the parts (he was waiting on some shunts), it will just take time for him to complete it. I asked him to take it and work on it, but it would take him more time to draw out his plans on paper than to just build the thing, both of which would happen in his spare time. Unfortunately that spare time isn't very plentiful...he still works at 68 and loves what he does (engineer). The teddy bears belong to my girlfriend. When we moved in I started stacking my PC stuff there but she wouldn't have it :shrug:. PC stuff got relegated to the spare room (where most of the review was done, had more space there). I think the HAF-X looks a bit nicer than the DF-85 at the front top half, but the DF-85 looks better at the bottom. I do like the fact that the DF uses a standard size of fan, which ought to make things easier if one fails in the future. Jonnyguru have reviewed the CP-1000 from an electrical point of view (see the link in the article) as well as the CP-850. The CP-1000 isn't a bad unit (the only major downside is the cable lengths are far too short) but it isn't much better than the 850 really. 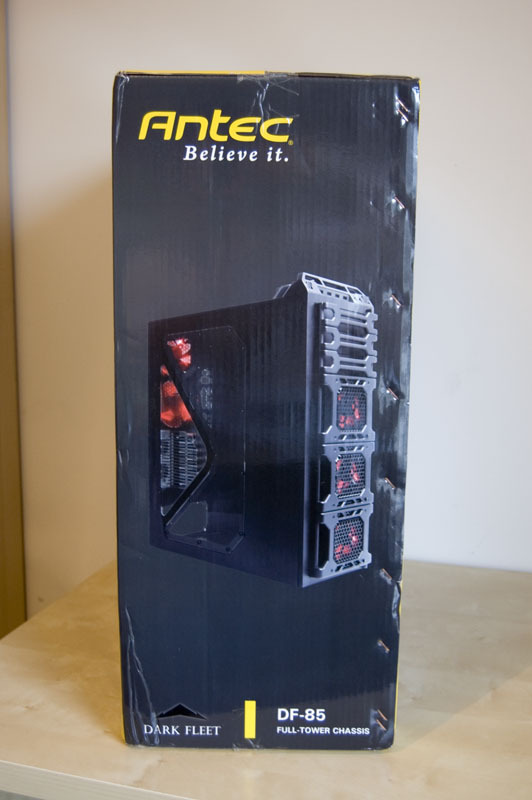 The CPX PSUs are huge, which ought to be a good thing (more room for components and cooling) IMO. Again, great write up... and I loved the addition of that pint of coffee, err beer. Pity that the PSU cables were short, and was also quite surprised for a PSU of that size it doesnt have both 4+4 and 8 pin CPU mobo power plugs as other PSU's of similar size do. 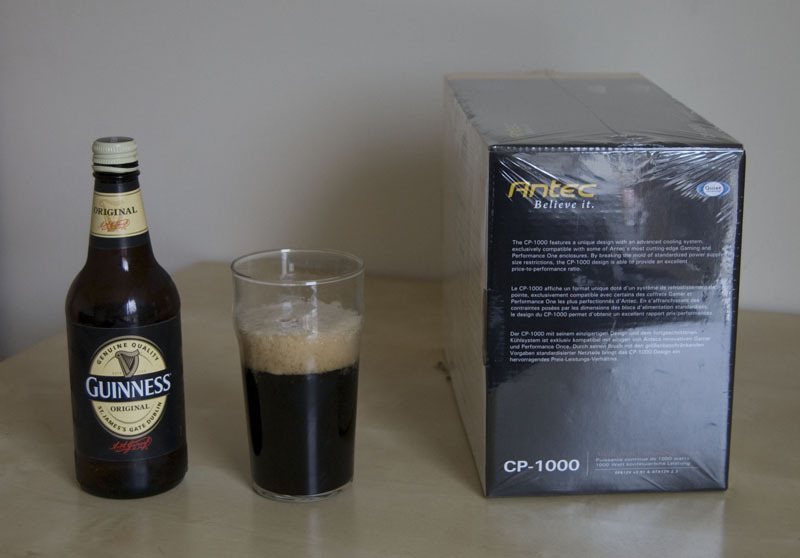 My girlfriend makes a fantastic stew with Guiness, but only ever uses a little. So, naturally, I need to finish it off :D.
The tray looks pretty good, apart from the fact I'd have loved for it to be removable. Which mobo power plugs do you mean? 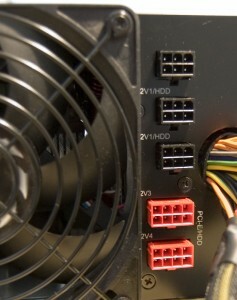 There's the ATX power plug, an 8 pin and a 4+4 I'm sure (I can check)? Well written review. But that case... Gaahh... Why is getting harder and harder to find an elegant case with nice lines? Not gunked up with plastic, and knobs and bobbles all over the place? Jesus...that case looks like everything I wish my HAF was. edit: closer inspection, and Im not as partial to the front facing hdd bays. I always prefered the sideways ones. I see CM listened and made the 942 black inside. 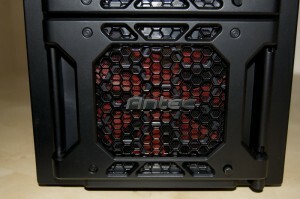 I do like the fan covers on that antec though. 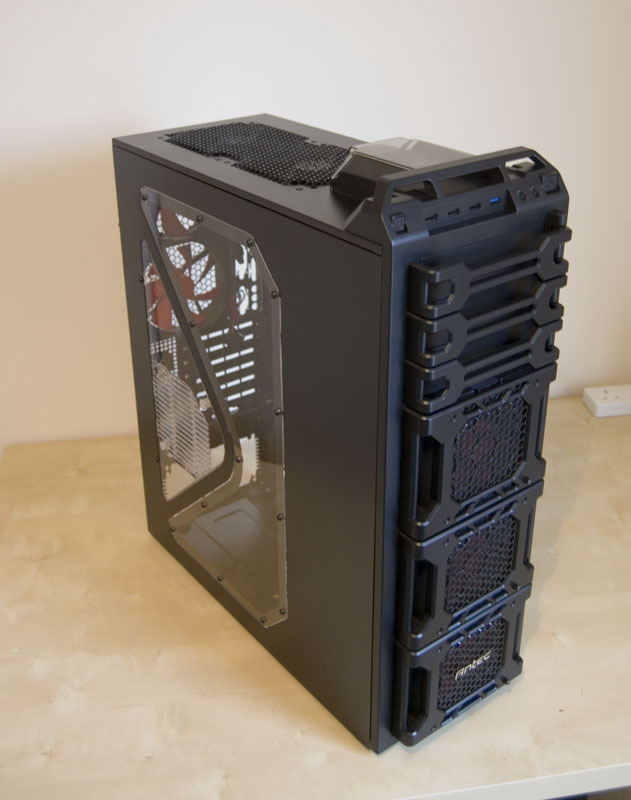 Any possibility to know if an triple rad fit in the front? 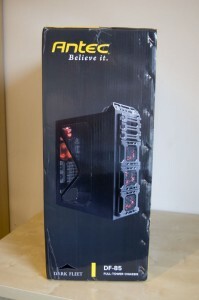 Prior to seeing this reviews I was looking into this case to do the paraflow mod on it with dual 120.3 rads on the side. 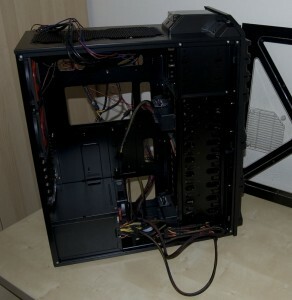 If you still have the case could you measure from the bottom, to the first 5.25 bay please? It's 39 cm from the floor of the case to the first 5.25 in bay. In that space there is a rack for holding 3.5 in drives which is, as you may guess, the width of a 3.5 inch hard disk drive. It's riveted in, which may make it a challenge to remove. 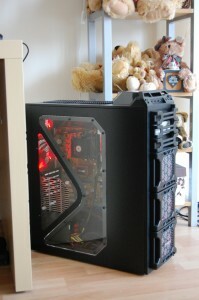 It may also contribute to the sturdiness of the case. 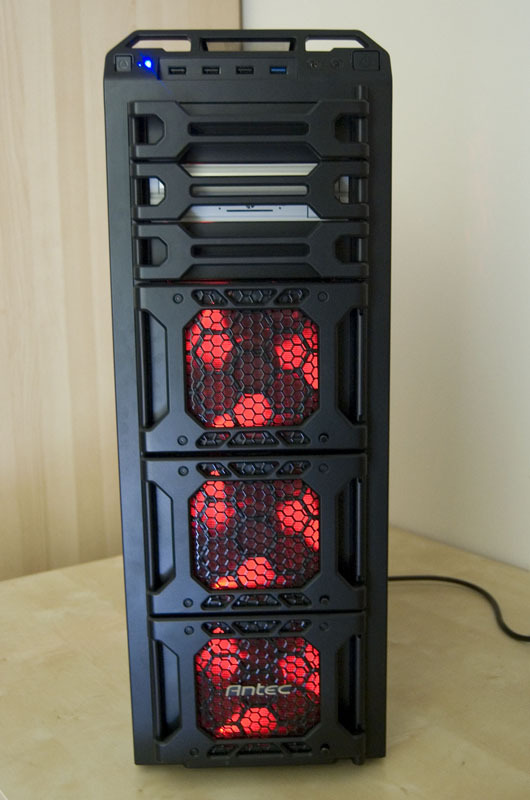 Looking at upgrading to a full-tower that supports liquid cooling, pretty sure this is the case I want to go for, only other cases that have really caught my eye are the thermaltake armour series, are these much better? I love the case, nice review David. 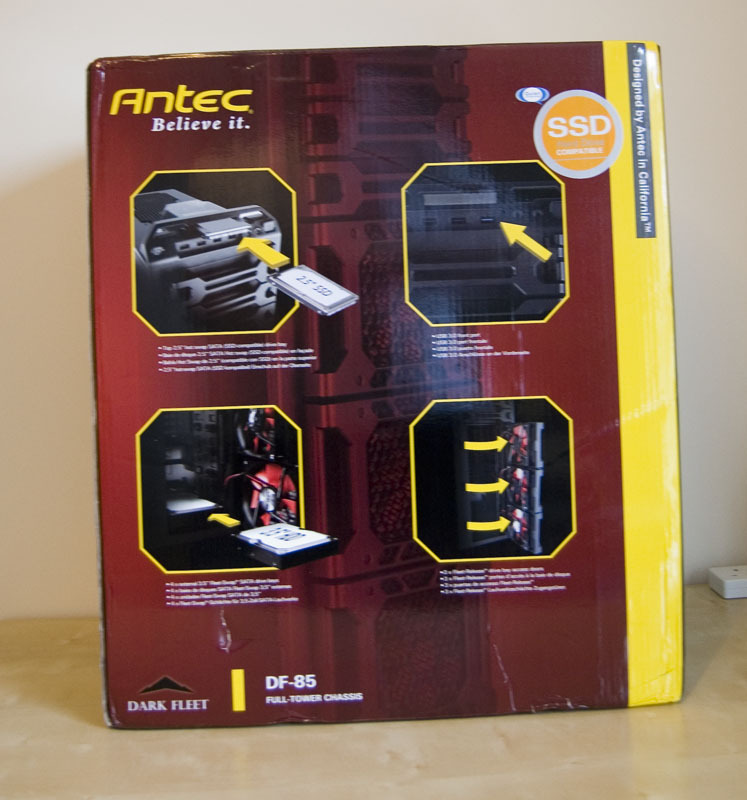 I have heard those PSUs are very good...but I wonder what the boys at Antec were thinking making the wires too short on what is basically a proprietary PSU designed for their own cases. Amazing, walk down the hall...measure something. Well I was wrong when I typed that up. 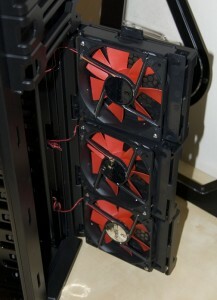 The rads fit vertically into the case, you just have to give them a little push to get them in. They fit very snug between the bottom of the case and the first bay. 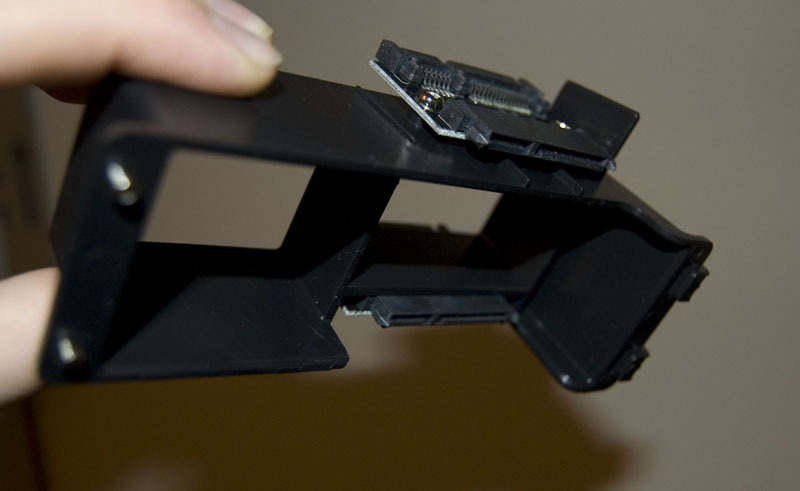 But the mobo tray is about 3/4 of an inch to long and needs to be trimmed in order to make the back rad fit.